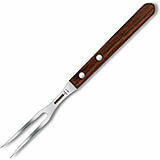 Now steadily slice meat, chicken, turkeys and more with exclusive collection of two-pronged forks! Available in varied sizes with quality handles, our carving forks allow you to gently puncture the meat and hold the meat in place as you slice it during the carving process. 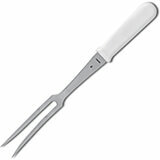 These carving forks aid you in picking up slices of beef or poultry to serve at your carving station. The two prongs of our top-of-the-line pot forks enable you to steadily hold or rotate the bulky meat as you carve it or cook it in large pots. Our cook forks serve as a great option to reach into a hot oven to move and rotate meat during broiling. We offer a diverse collection of heavy-duty carving and cook forks, which are an intelligent and economical alternative to stamped knives. You can also choose from a variety of handle types made from wood or high-grade plastic materials for a soft and comfortable hold. These commercial forks are a great addition to any home or restaurant cutlery collection. The durable rosewood handle is ergonomically designed to help minimize tension at the wrist. The rosewood wooden handle knives are rustic and elegant kitchen knives that look great on the kitchen counter. The carving fork is sturdy enough to lift a roast from a pot, use to carve the roast, and then serve. The spaced prongs allow you to slice between the prongs for uniform slice sizes. 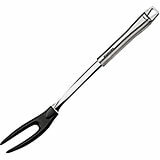 All Stainless Steel Dual-tined Serving Fork, 13.13"
13.125" X 1.5" X 1"
All Stainless Steel Long Potato Fork, 6.63"
Black, Composite Material Pa+ Meat Fork, Stainless Handle, 13.38"
The Paderno World Cuisine 13 3/8" long composite meat fork has a stainless steel handle. It has a loop on the end for easy hanging and storing. The length of the fork keeps hands a safe distance from the heat of the oven or pan. It is typically used to turn roasts and large pieces of meat. All of the items in Paderno's PA+ line are constructed of a unique combination of nylon and fiberglass. This material is dishwasher-safe. Material: Stainless Steel. 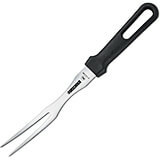 Black, Stainless Steel Chefs Fork, Forged, 5.12"
The Paderno World Cuisine 5 1/8 inch forged chef's fork is designed with two long, sturdy tines for turning and positioning food during the cooking process. 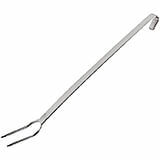 The fork handle is resistant, non-slip, made of an inert plastic material, and composed of stainless steel inserts. 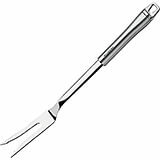 The Paderno World Cuisine 5 1/8 inch forged curved chef's fork is designed with two long, sturdy tines for turning and positioning food during the cooking process. The fork handle is resistant, non-slip, made of an inert plastic material, and composed of stainless steel inserts. The Paderno World Cuisine 6 5/8 inch forged chef's fork is designed with two long, sturdy tines for turning and positioning food during the cooking process. The fork handle is resistant, non-slip, made of an inert plastic material, and composed of stainless steel inserts. 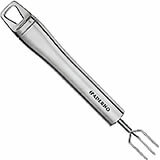 Stainless Steel Oversized Pick Fork, 39.37"
39.38" X 1" X 1"
The Paderno World Cuisine one piece oversized stainless steel chef's fork has two long sturdy tines for turning and positioning food during the cooking process. Stainless Steel Pick Fork, 19.62"
19.63" X 1" X 1"
The Paderno World Cuisine one piece stainless steel chef's fork has two long sturdy tines for turning and positioning food during the cooking process.